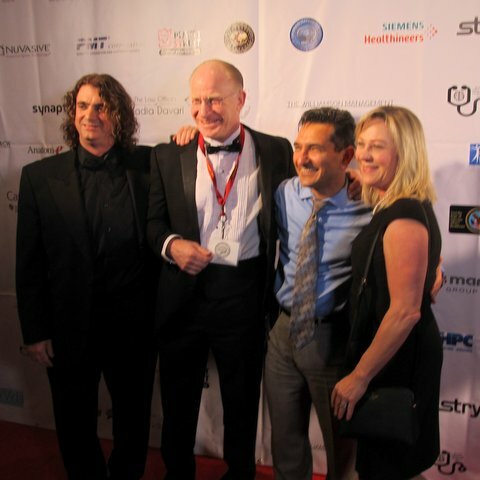 On April 20th, the Brain Mapping Foundation hosted a red carpet gala at the Millennium Biltmore Hotel to honor the top medical professionals who are breaking boundaries in the field of neurological disorders. A number of celebrities attended the Black Tie Event including the lovely, beautiful, and talented actress Vida Ghaffari. This year 320 pioneers in the field addressed state-of-the-art brain science and technology, and diagnostic therapeutics for Alzheimer’s Disease, Parkinson’s Disease, brain and spinal trauma, brain cancer, psychiatric disorders, the Autism spectrum, Post-Traumatic Stress Disorder (“PTSD”), in addition to other neurological disorders. Award winners recognized for their research were Professors George Ojemann and John Adler (inventor of Cyberknife)—recipients of the Pioneer in Medicine Award. Congressman Jerry McNerney (Pioneer in Healthcare Policy Award). Professor Afsaneh Rabiei (Pioneer in Technology Development). Dr. Wes Ashford and Dr. Michael Roy (Golden Axon Award for Leadership). Dr. Nasser Kashou, Dr. Ajeet Kaushik, and Dr. Alexander were the recipients of the Young Investigator Award. The Society for Brain Mapping and Therapeutics is a non-profit group organized for the purpose of encouraging basic and clinical scientists who are interested in brain mapping research, engineering, stem cell, nanotechnology, imaging, and medical device to improve the diagnosis, treatment, and rehabilitation of patients afflicted with neurological disorders. Visit their site for more info.